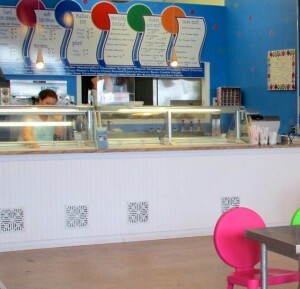 When you see the ice cream at Gracie and the Dudes, you may be surprised. The strawberry has only a hint of pink, and the other colors are similarly muted. Even the Italian ices they make are pale, in contrast with the vivid palette of the store and the eye-catching cartoon logo. “Taste it before you judge it,” says Michelle McMullen, co-owner with her husband Brian of Gracie and the Dudes (and Sadie too!). The shop’s most popular flavor, an intense dark chocolate, resembles Belgian chocolate. Cinnamon oatmeal and chocolate chip cookie taste like chilly versions of their namesake cookies. The flavors are concentrated and remarkably authentic. 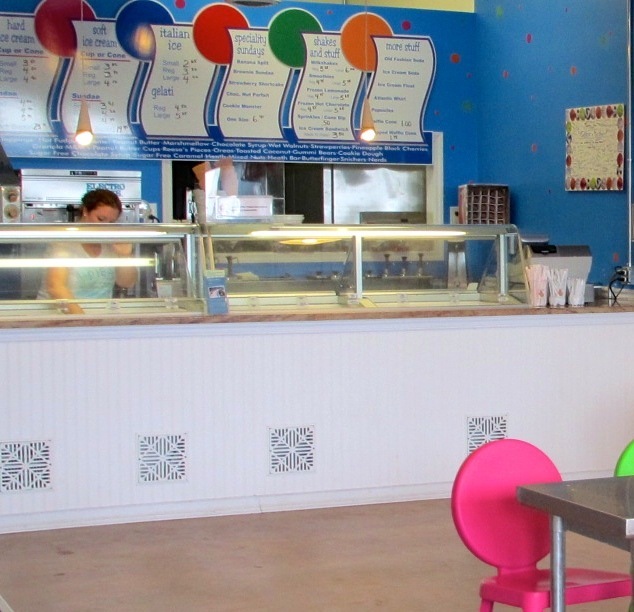 How does this small family-owned ice cream shop with two locations in Long Branch and Sea Bright accomplish this? We make enough for our pockets. We want regular families to be able to come and not break the bank. A ton of hard work testing and developing their own flavors from scratch, Michelle says. 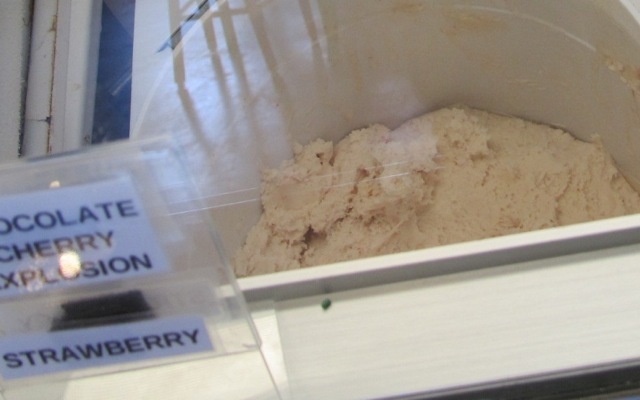 Because it lacks artificial flavors and colors, the ice cream has only a two-week shelf life. In the fledgling days of their business, much of it had to be donated or discarded. Michelle McMullen scoops a cone of her homemade ice cream. Twenty flavors are on display, with more than 65 in rotation, and more to come. “Customers are very vocal,” says Michelle. Last month olive oil debuted. The general reaction was “ehh.” Maple bacon was a temporary hit and sweet corn is on its way, by popular demand. The married couple were successful national franchise owners, using pre-mixed formulas, but began to worry about the ingredients in the treats their kids were ingesting. In 2009, the eldest, Gracie, was no longer a baby. “We started thinking about what we were giving her,” Michelle says. They knew they wanted to make something different, something fresher, with high quality ingredients. Even what’s in Italian ices is “horrendous,” so they created their own, which is technically sorbet, with three ingredients: fruit, water and sugar. The cherry flavor tastes like cherry pie, says Michelle, a former high school English teacher whose language skills are evident in the entertaining copy on her website. Learning the food science behind ice cream was tricky and their biggest challenge. Sadie (far right) is the newest addition to the family & business too! Another complication came in the form of a new baby, a girl named Sadie. When Sadie turned four, she became aware of her conspicuous absence in her family’s business. Another challenge was Superstorm Sandy in 2012. Michelle worked toward recovery and rebuilding on the Sea Bright 20/20 Committee, the precursor to Sustainable Sea Bright, a municipal committee. “We are committed to making Sea Bright sustainable for the future. We worked to bring a farmer’s market to town as well as having Sea Bright designated a sustainable community by the state of New Jersey,” she adds. “The one benefit that came out of the storm is my commitment to making Sea Bright the best it can be, as well as the people I’ve met and the dear friendships I’ve formed.” Michelle traveled to New York with Mayor Dina Long to the ask for help. So is healthy ice cream an oxymoron? Michelle nods as if she’s heard this before. “It’s healthier,” she qualifies. Everybody gives their kids an occasional treat, she contends, so why can’t it be from the best ingredients, which also taste the best? The McMullens say they use less sugar than is standard, and have a formula that works. The store’s cream is from Wisconsin, so shipping costs more than the product itself. Michelle says that wasn’t by choice; they couldn’t find a local supplier who could adapt to what they needed. “Our prices are lower,” Michelle claims. “We make enough for our pockets. We want regular families to be able to come and not break the bank.” As for a complaint online about not selling single scoops, she nods.